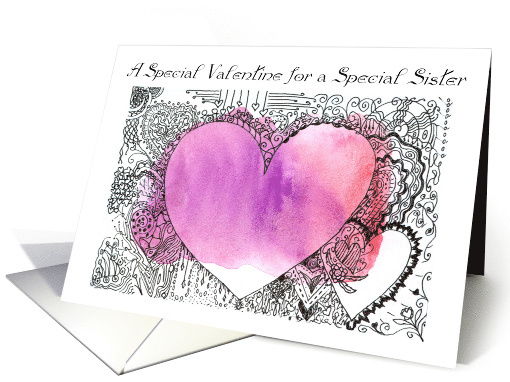 The original work of art (without the lettering) is called “Positive Space.” But this card that I designed is a “Special Valentine for a Special Sister.” Some of you might ask if all sisters aren’t special? I would hope so, but of course they aren’t. When you do have a sister who is above the average of sisterly-ness, it’s worth taking note of! This card and others are in my shop at Greeting Card Universe. Please take a look (GCU offers free shipping for 10 or more cards or free pickup at Target Photo). This entry was posted on Thursday, January 17th, 2019 at 4:52 PM	and is filed under Art Talk. You can follow any responses to this entry through the RSS 2.0 feed. You can leave a response, or trackback from your own site.